When Deborah first told me of her intentions to sell her building, it wasn’t a surprise. Selling a building after 27 years of investing hundreds of thousands of dollars into restoring and maintaining it is obviously a retirement plan. What was a surprise, however, was my immediate emotional reaction to the news: I was sad that I wouldn’t see Deborah (nearly) every day. Deborah has become part of my life. My little Yoda. And she’s other people’s Yoda too. From one business woman to another, I value her more than she knows. That’s why I am so excited for her to be releasing her building to a new “caretaker owner,” as she calls her future prospect, whomever that may be. Maybe another woman! Who knows. Filling the space of the front office in the Telephone Building was a dream that occurred to me while attending the going-away party for the Nixie Sparrows. Remember those two creative birds? WOW, did a lot of creativity come out of that office - now this office that I sit in. 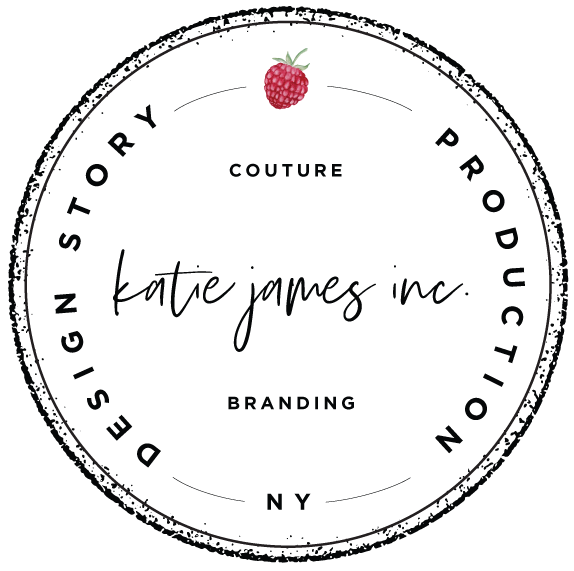 I’ve been working in the digital space for 2 years as a website designer, blogger, motivator, and teacher. Occupying a physical space isn’t necessary for us digital artists, but when you’re mainly prancing on a keyboard, the desire for physical creation and connection grows. The first space in Beacon that actually cracked into my brain as a potential work home was the tiny hallway of a space next to the Beacon Hotel (and I’m not alone… many people have fantasized about having a retail something in that space). The former Howling At The Edge Of Chaos (blessings), and prior to that, it had been something else whimsical. I’d gotten word that it was becoming available, and I considered occupying it for my blogging headquarters. And hey, maybe I’d also rent it out for pop-up shops, since those are so fun in Beacon. And then the Nixie Sparrows flew the coop, and I began stalking their landlord: Deborah Bigelow. Deborah Bigelow is a very small person physically, but a ginormous person in her field, which is the gilded and preservation arts (covering things in gold leaf and restoring anything). Before I even met her, I knew of her via Instagram as @gildedtwig. In fact, she gilded a pumpkin for an article on A Little Beacon Blog once. I never knew at that point that she was the owner of the Telephone Building. When Deborah interviewed me to take the space, she had other suitors. This room is a very desirable space. It’s very bright, and the Nixies had strung lights and commissioned a really cool metal/wood bar for the room (which I bought from them in order to keep in the space… and it even has a love story connected to it!). So I had to impress Deborah and hope that she liked what I wanted to do with the space. I wanted to use the space for pop-up shops, workshops and retreats. She warned me over and over of the lack of foot traffic (it has since picked up over the years that I’ve been here). I didn’t care. I’m from the digital world, so I’m used to working for every person that walks through the door. I don’t just hang my shingle and wait for the people to come in. I hang my shingle, and the work has just begun. It’s why I named my marketing education business Tin Shingle. Tin is a resilient metal, and Shingle is a store sign. It’s the first of many steps to bring people in. And A Little Beacon Space has done that. It has brought people in for all kinds of reasons. 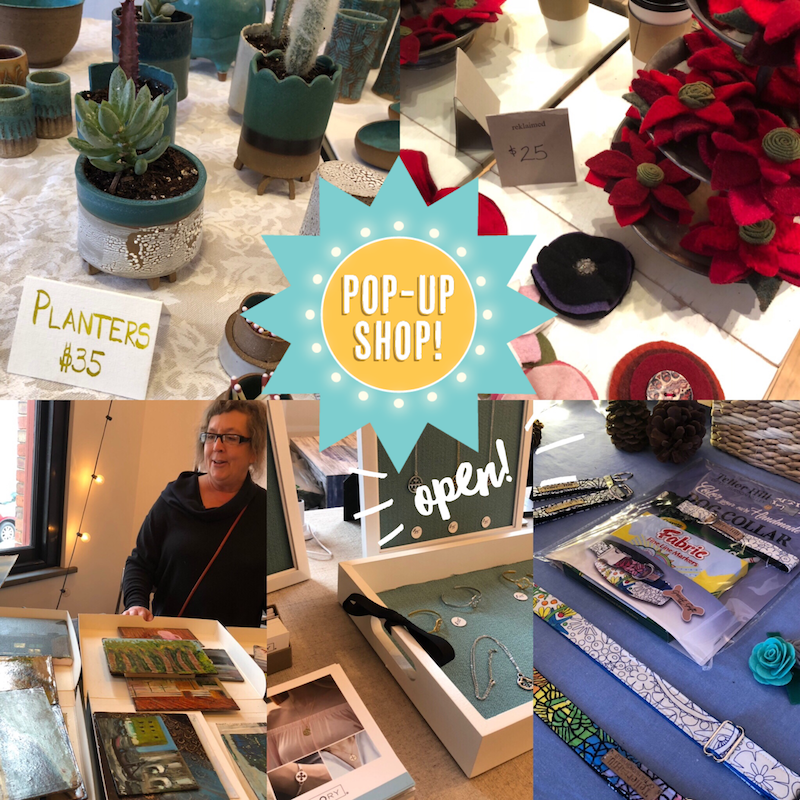 From the private book club I did a year ago for The Artist’s Way, and formed incredible bonds with a handful of women, to the pop-up shops that have set up amazing displays in here, and had tremendous results. Better than they expected. 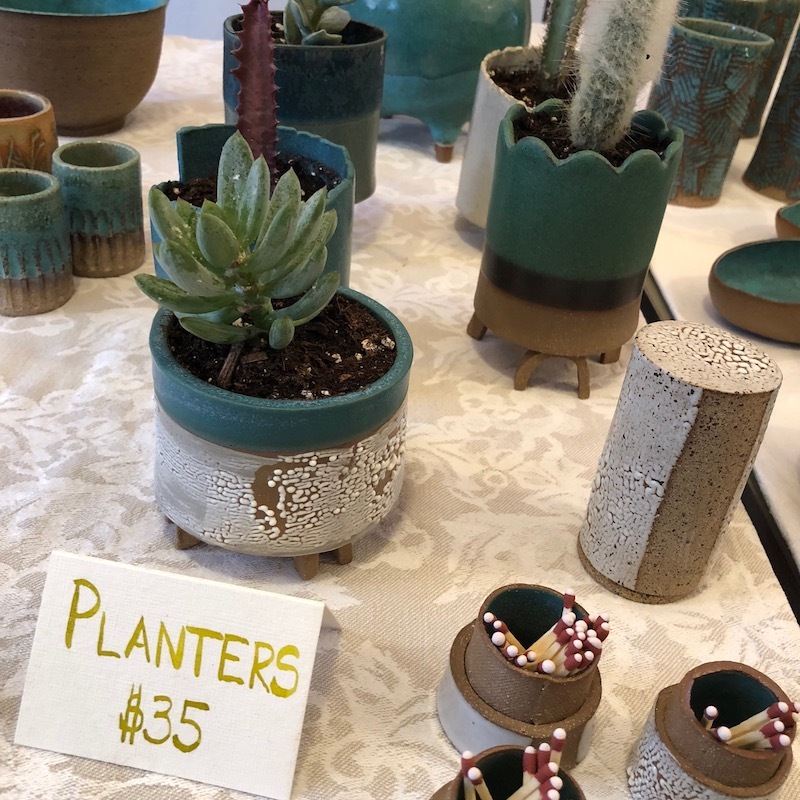 In fact, one of possibly your favorite little shops in Beacon, Artifact, started as a pop-up shop here and now has their own brick-and-mortar spot near Dogwood. We even did kids’ hair cuts with Salon Dae! And now I go to Audrina for my cut and color. The more I learned about Deborah, and her years here as a landlord and as a restoration artist, the more I couldn’t believe that more people didn’t know about her. I mean - super-local people know her from diligently sweeping the Telephone Building’s steps and using a toothbrush to clean cigar spit from her limestone steps. The owner of Cafe Amarcord is one of her silent protectors, as he’s been watching for years as she picks up the trash people leave around the place, and the challenges she’s faced from those with a little too much moxie out on the sidewalk. I call Deborah a “restoration artist.” She tells me that it’s not an official term, but she’ll accept it if I call her that. She has binders filled with notes of history of what has happened in the building - from tenants’ agreements to notes to evidence of tomfoolery (really nice word for criminal behavior) that she’s endured over the years. She is one of the founding participators in Beacon Speaks Out, which had been working toward involving the community with the police department. She even has detailed notes on how the Nixies strung the lights on the ceiling here in the office, in case we need to replace them. Deborah is a very calm and planned person. She’s from Pennsylvania and extremely respectful of others, and an up-lifter of the spirit. When I took this space, it was on a wing and a prayer. She supported me every step of the way. If I was feeling down or doubtful, she was there to lift me up. Therefore, it is with great pleasure that I watch her reach her point in “retirement” and move into her own next steps. She is selling the building directly herself, and has a website for it that gives plenty of information, like pictures and numbers. You can even see Before and After photos of her renovation. She has listed the building in A Little Beacon Blog’s Real Estate Guide, and when she handed me the layout of photos for the listing (she wanted them in exactly a planned way… so Deborah!) she did so with tears welling up in her eyes. As I took the piece of paper from her hands, I brushed away our tears and kept our eyes on the future. My own children asked me this question when I told them the news. Friends on the street who are hearing the news are asking it as well. I’m asking it of myself! I’m on a month-to-month lease right now. This is actually an exciting prospect to me. I like change. It sparks new creativity. It unplugs some clogs that I didn’t know were there, and makes things flow freely again. It reveals thoughts and priorities that often sit silently on the back burner, being ignored. So here’s the thing. I don’t know where A Little Beacon Space will be. There are many scenarios that could play out. A new owner could buy the building, and not need the rent money, and keep my rent the same. As you can imagine, this building was bought 27 years ago, and Deborah has been very kind to us for rents. For a storefront space on Main Street in the heart of Beacon, with two walls of windows that let in glorious natural light from historically renovated windows, my rent is below market value at $1,260. If it increased, could I sustain it? Possibly. Buy the Building? While my first thought was to assume that I’d exit out of the building, my next thought was to buy the building. 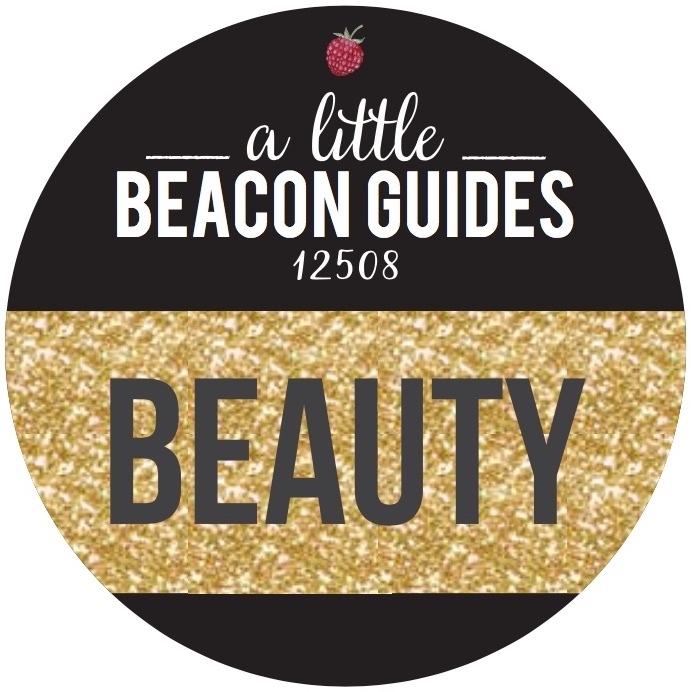 My husband and I considered this, as a handful of people around us have expressed interest in investing in Beacon. The first building we seriously thought of buying was actually the yellow house with the warehouse behind it, formerly Trendy Tots. That’s what hooked us into Beacon in the first place. It was $450K at the time, and sold for nearly a million! Kicking ourselves! 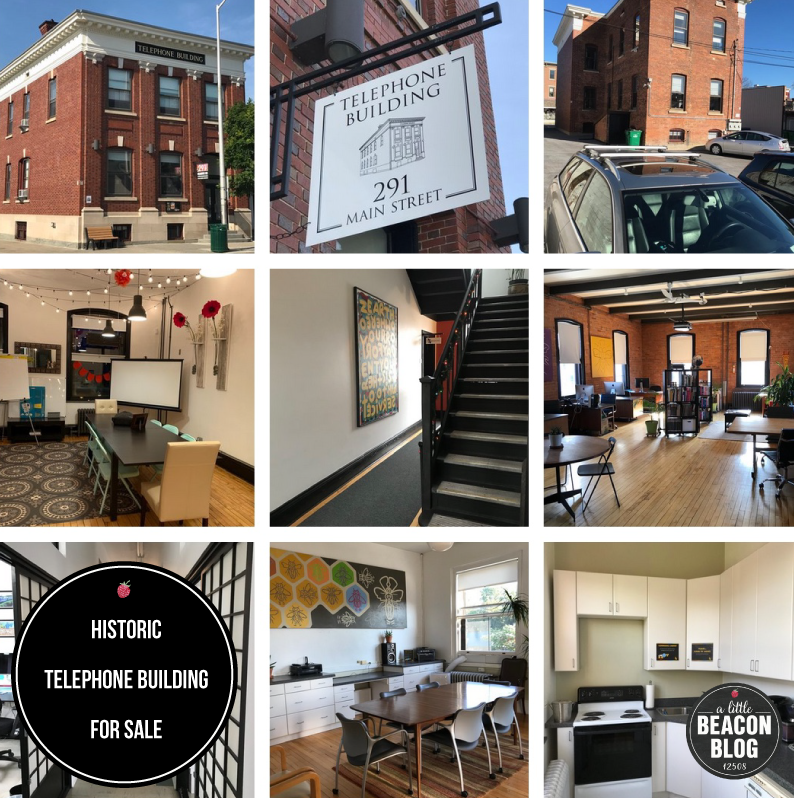 Presented with a perfect building such as the Telephone Building, getting together the down payment would still be tricky and involve me finding grants, such as women-owned business grants or historic building grants, and that’s a lot of homework that is not my specialty. The business model would also be tricky, but could involve me starting a podcast production studio in the basement - to add audio to media available from A Little Beacon Blog with different podcast shows. Writers and production for the web version of A Little Beacon Blog could also come in for shared office hours and write and be a team together. I would keep my current space as a fancier event space for rental income, which it is now. Weather the Rent Increase: Possibly. 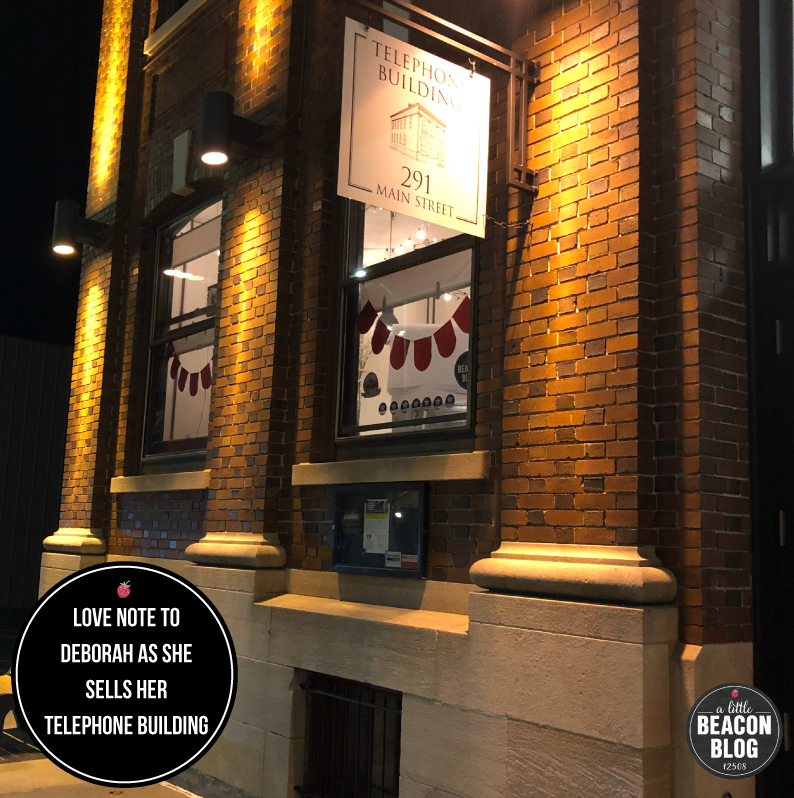 If the new building owner(s) wanted A Little Beacon Blog and Tin Shingle to stay there and continue to offer the space as a venue for creatives and community, I would take a harder look at my marketing plans. A Little Beacon Trailer! I really love trucks and trailers. I would love to tow my office behind my ginormous, un-eco-friendly car that can tow 9,000 pounds. What about a mobile office? I discovered the people at Flexetail, and aren’t those trailers gorgeous!?! My friend Sh* That I Knit got one, and when my girl here in Beacon, April from La Mère Clothing and Goods got her trailer for La Mère Petite, I couldn’t take it anymore. I need one. Maybe A Little Beacon Space would be a vendor down at Long Dock and have pop-ups sometimes?! Little Beacon Spaces (as in more than one)? Maybe there could be more than one Little Beacon Space… There certainly is a demand for office space and I would love to be a provider of it…This is a bigger project, but is in Research Phase. Go Home? I worked from home for 11 years. I could do it again. I’ve worked from my car from parking lots at Panera, skimming their wifi. But maybe I should stay out here in Brick and Mortar Land. What do they say? Go big or go home? So I’m going to Go Big for now. A Little Beacon Space is going to market like gangbusters to rent out our space for workshops, retreats, photo shoots and pop-ups. Tell your friends! We’re only booking two months in advance until things become clearer of what is happening. Details and to book online are always at www.alittlebeaconspace.com. Thank you for listening. While change creates uncertainty, please join me in wishing Deborah the best as she enters into this new phase. Wine and liquor stores in Dutchess County are required by law to close at 7pm, as we discussed with Artisan Wine Shop when we discovered Artisan’s petition asking for extended open hours. Wine shops in surrounding counties are able to stay open longer, but thanks in part to some liquor stores fighting years ago to keep a short leash on the closing time, the 7pm law has remained in effect for Dutchess County. This law is being challenged on Thursday, April 4th by a new resolution authored by Dutchess County Legislature Frits Zernike and co-authored by Dutchess County Legislature Nick Page, which proposes that stores be able to stay open until 9pm. Frits will present the resolution tonight at the April 4th Legislative Committee Meeting, which is open to the public to attend and voice opinion. 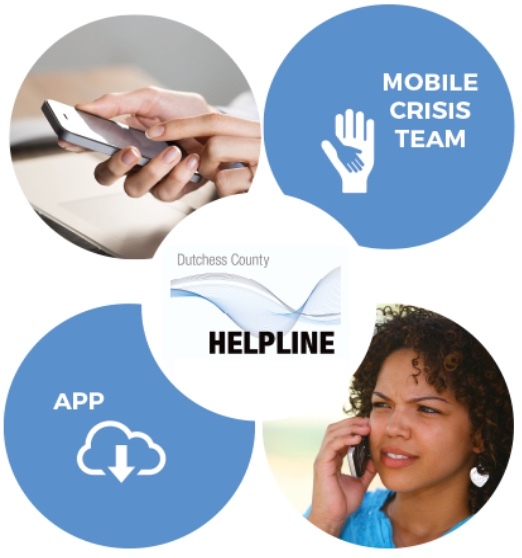 “Dutchess County, for all its advances in recent years, remains a backward place,” said Frits to A Little Beacon Blog via email. “Our opening hours are the most restrictive in the state, and we lose business to neighboring counties with less antediluvian laws because of them.” In the past, county representatives from Beacon, including Jerry Landisi, have challenged this law. “Similar resolutions have been introduced in the past, and have never made it out of committee,” said Frits. The resolution that Frits is proposing today requests that wine and liquor stores “be permitted from 9 am to 9 pm on weekdays, as well as on New Year's, Memorial, Independence, Labor, and Thanksgiving days, and on the day before Thanksgiving, December 18th - 24th and New year's Eve,” as stated in the resolution he authored. 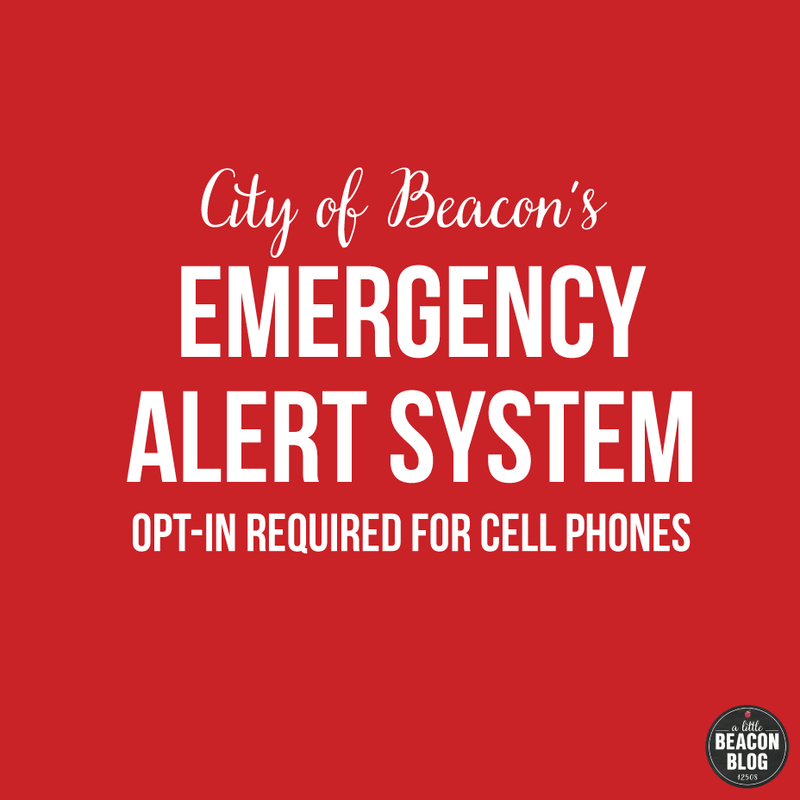 In April 2015, The City of Beacon created its own resolution to show support of extended open hours, which was signed by nearly all of Beacon’s City Council at that time: Charles P. Kelly, Pamela Wetherbee, Ali T. Muhammad, Lee Kyriacou, George Mansfield, and Mayor Randy Casale (Peggy Ross was absent for the vote). But the law was never able to be changed. Why The Opposition To Later Than 7pm? Artisan’s petition is in support of this resolution. Artisan Wine Shop has since then amassed more than 200 signatures from customers who do want longer shopping hours, who may not have returned the next day. Beacon is a commuter city, where many people are beginning to arrive home at 7pm. Shops who close at 6pm or 7pm often leave commuters shopping on the weekends if at all. Beaconites often head off on day trips out of Beacon and may or may not be able to hit up wine stores in Beacon to stock up on bottles for the week if they can’t shop after 7pm during the week. Wine shops outside of Beacon may benefit, however, as people are doing errands on Rte. 9 and are in other towns on day trips. Editor’s Note: there are other wine shops in Beacon, and should we get input from them, we will update this article. Usually this requires us visiting them in person. This resolution proposing a longer open time will be presented on Thursday, April 4th 2019 at a Committee Meetings at 5:30pm in the County Legislature chambers. That location is at 22 Market St., 6th Floor in Poughkeepsie. Members of the public are invited to speak on agenda items at the meeting. There is a three minute time limit for each individual's comments. Will Open Hours For Wine and Liquor Stores Change This Time? Will the law change this time? Allowing wine and liquor stores to stay open past 7pm? When the rest of retail locations like bars, breweries, beer stores and gas stations that sell beer are open long into the night? UPDATE 4/4/2019: Artisan’s petition supports a resolution that Dutchess County Legislator Frits Zernike has authored, which requests that the law be changed to allow wine and liquor stores to remain open longer. Read more about that resolution - being presented on Thursday, April 4 - here. If you’ve ever sauntered to Artisan Wine Shop on a summer evening, only to be met with a “Closed” sign at 7:30 pm, it’s not because they want to call it a night. Wine and liquor stores in Dutchess County are not allowed to stay open past 7 pm. Many people leaving their desk in New York City, Westchester County or Poughkeepsie (or anywhere else that involves extended commute times) often arrive home after 7 pm. Which means they are not able to shop for wine after 7 pm. Currently, the hours of retail sale of wine and liquor in Dutchess County are restricted to 9 am to 7 pm on weekdays (defined as Monday to Saturday), and 9 am to 10 am on New Year’s, Memorial, Independence, Labor, and Thanksgiving days. You read that right - one hour on those holidays. “We usually don’t even open on Thanksgiving, Memorial Day, or the Fourth of July,” said a staff member from Artisan Wine Shop when A Little Beacon Blog called to confirm the one-hour holiday policy on those days. People can, however, walk down to a wine bar, like Chill or Oak Vino, who can be open late into the night. Or, people could stop into a beer shop, like Beacon Craft Beer Shoppe next door to Key Food, to stock up on creatively brewed craft beer. People could decide to patronize any of the growing number of craft breweries in the area, like Two Way Brewing or Hudson Valley Brewing Company. While you’re at it, a person could even go to a whiskey distillery tasting room, like Dennings Point Distillery by Rite Aid, to sip a little and listen to live music late at night. Crossroads Wine and Spirit in Fishkill asked local government to extend Open hours in 2014, as it was hurting their business to close at 7pm. They have since closed this location. Inside of Artisan Wine Shop. Now it’s March 2019, and there is a stack of signatures on a petition on the counter at Artisan Wine Shop, asking Dutchess County to let wine and liquor shops stay open until at least 9 pm. From Artisan Wine Shop’s petition, supporters from all over Dutchess County - not just Beacon - are encouraged to write to their county legislators, both to the General legislature email address, and to one’s own county legislator directly. Artisan Wine Shop is located at 180 Main Street, Beacon, NY. And they’re only open until 7 pm, so plan accordingly. The new 2019 Beacon Theater marquee (Top left) harks back to a more glamorous time. Note the boarded-up doors In the Photo at Top right, after the decline of Beacon from its glory years of the 1930s, to the depression it endured in the ‘60s and ‘70s. The reinvigorated Beacon Theater is located at 445 Main Street. View from the storefront window of La MÈre Clothing and Goods, located across the street from the theater. She published it on her Instagram. Someone is excited! 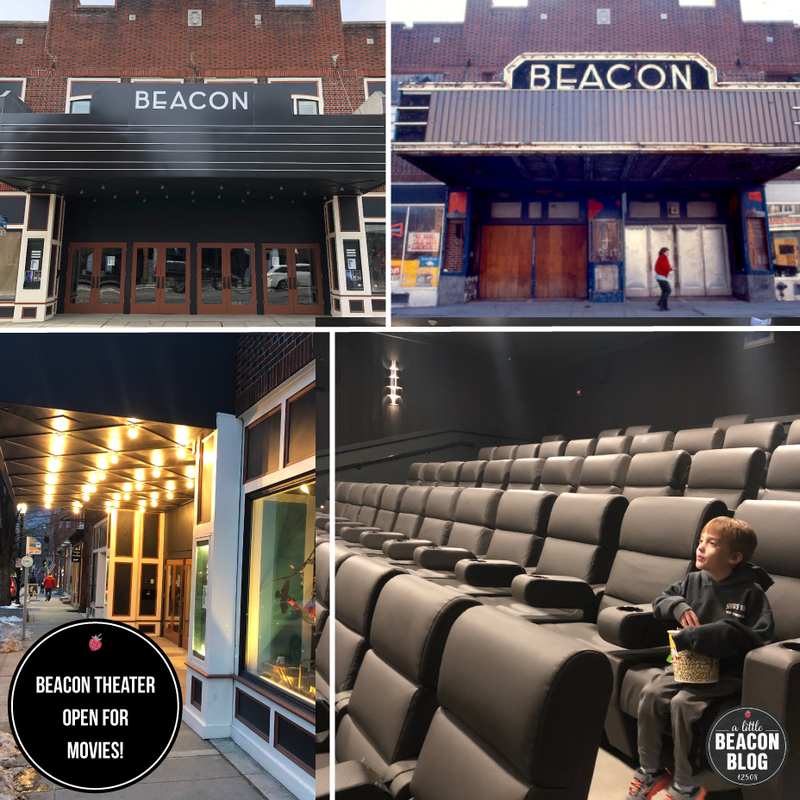 The wait is over for one of the most anticipated Main Street openings - the Beacon Theater at 445 Main Street is now open, the marquee lights are on, the popcorn is popping, and the movies are playing. The building that houses the theater, down on Beacon’s east end near Joe’s Irish Pub and La Mère Clothing and Goods, has been home to many businesses. 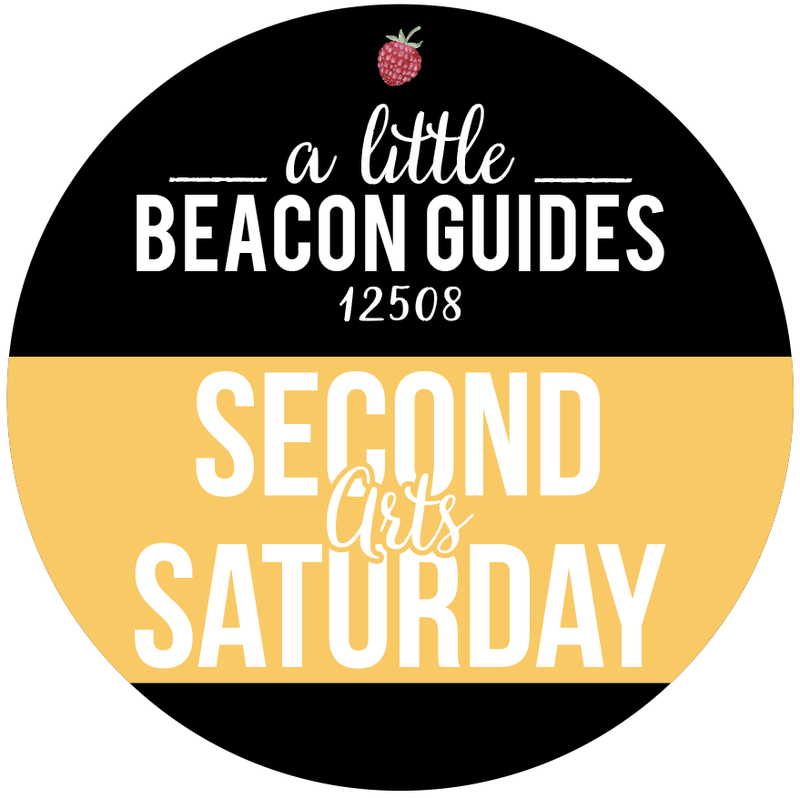 According to the book Historic Beacon (pick up a copy in neighboring Beacon Bath & Bubble! ), Warren S. Dibble, who purchased the hotel across the street (see our article on its major renovation a few years ago) in 1877, built a roller rink in this spot in 1884. When roller skating didn’t catch on as he had hoped, he built the Dibble Opera House by 1886. In it, he built a 1,300-seat hall, and according to the book, made “a high-class of entertainment to an appreciative public.” After that, according to Historic Beacon, the Beacon Theater was later constructed on the site. A well-known jazz bar, the Wonder Bar, also opened on the second floor of the theater. The theater avoided being bulldozed during Urban Renewal, when many of what would have been historic buildings were demolished in Beacon and other nearby areas. 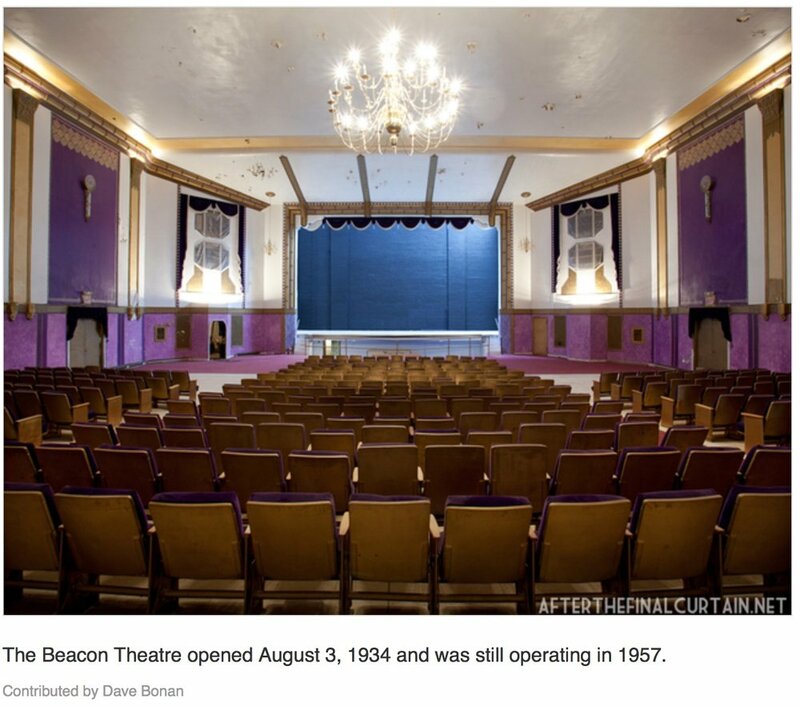 Behind the operation and curation of movies shown at the Beacon Theater is Story Screen, Beacon’s original traveling, pop-up movie theater experience. Story Screen shows already-run films. Originally, they set up the projector in local establishments like Oak Vino and More Good. Tapped as a partner in this project, Story Screen now has a permanent home in the Beacon Theater. Hankering to see an old favorite on the big screen? Send them a request! Maybe they will play it. I’m going to ask for Working Girl. A first-run showing of a locally produced documentary from Ana Sofia Joanes, Wrestling With Ghosts, is playing now, and has already sold out some screenings. Movie tickets are $10 for adults, and $8 for kids, and for now, are sold in person at the box office only. Online sales are coming soon. Movie times run all day from Thursday to Sunday. “As we get further along in our operation,” said Story Screen’s Brendan McAlpine, “we will also show first-run and indie films.” Movies currently in the lineup are already-run films, and include classics like Bill and Ted’s Excellent Adventure, Moonlight, Beasts of the Southern Wild, Good Burger, Wrestling with Ghosts, Heathers, Cruel Intentions and Wall-E. Check out which movies are playing on which weekends, see the Story Screen website and click on the row of dates above the listings. My little assistants and I happened to come at just the right time in between shows during the theater’s soft opening last weekend, so we were able to buy a tub of popcorn and Skittles (extra sour in the green bag) and get a tour. Let’s go inside and look around! 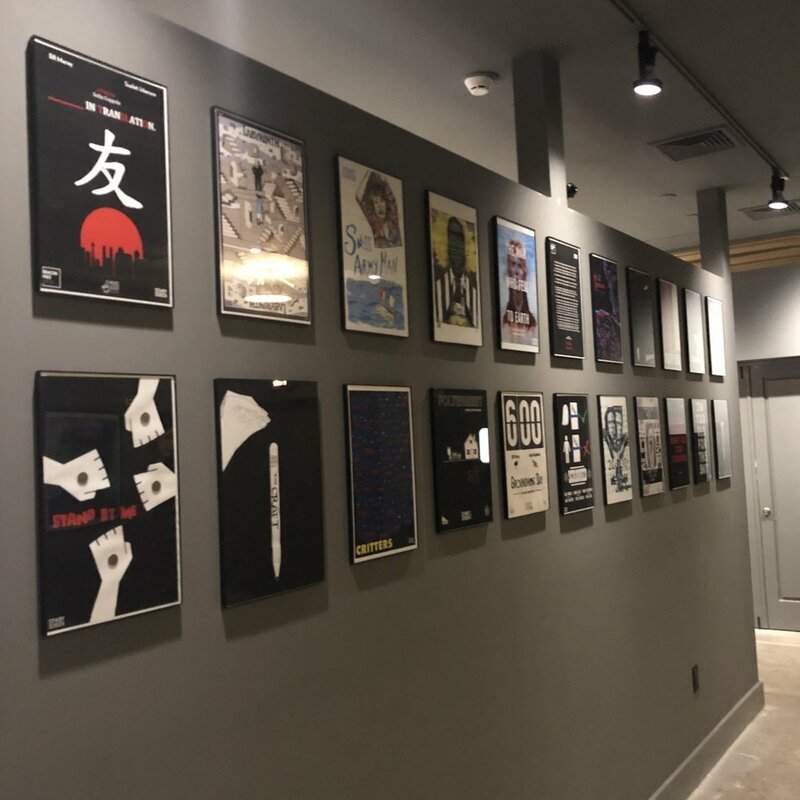 The theater is modernized with “incredible” sound, said Jason Schuler of Drink More Good, who is one of the Beacon Theater partners spearheading the food and drink experience. Some design elements were chosen to honor the time period of the original theater. Note the light sconces on the wall of the theater. According to Jason, the original sconces (pictured on the purple wall in a photo toward the bottom) were too far gone to completely restore, so they sought out a light that complemented the decor. The direction of the screen remains the same. People in the theater decades ago sat in the same direction to watch what was on the stage. 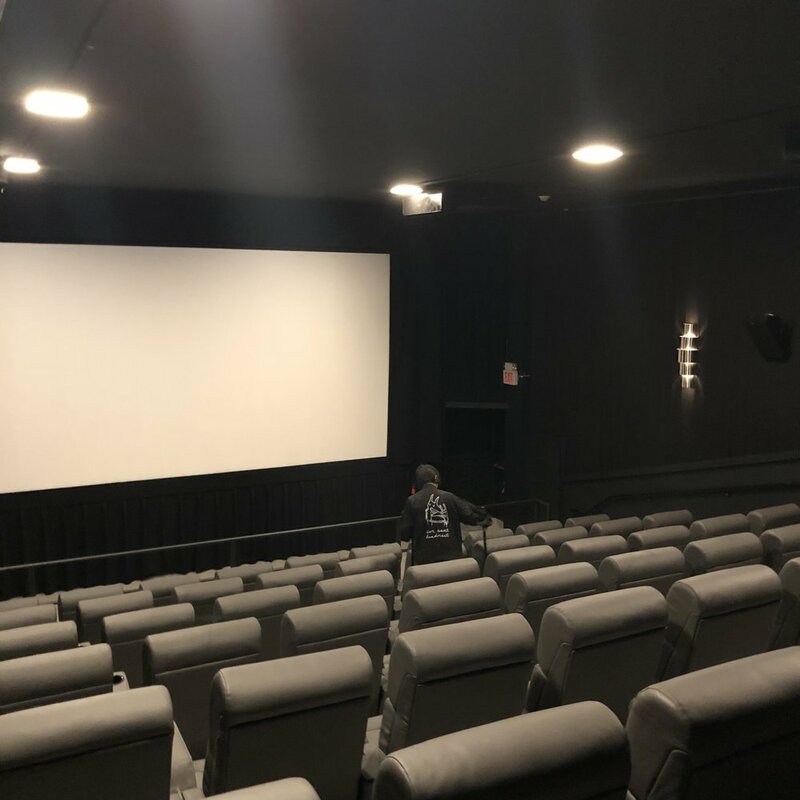 Today, the building has two movie theaters that have stadium seating, and a third theater will be available for private rentals for various types of events. Pictured below is the theater after it was painted purple, with gold detail, decades ago by the church. Who could blame them for using this irresistible hue - I have painted a few rooms purple in my house! Photo Credit: The picture of the theater on the left is a screenshot from a photo published on AfterTheFinalCurtain.com. Impressively designed bathrooms have become a big deal nationwide, and Beacon is proving no exception. 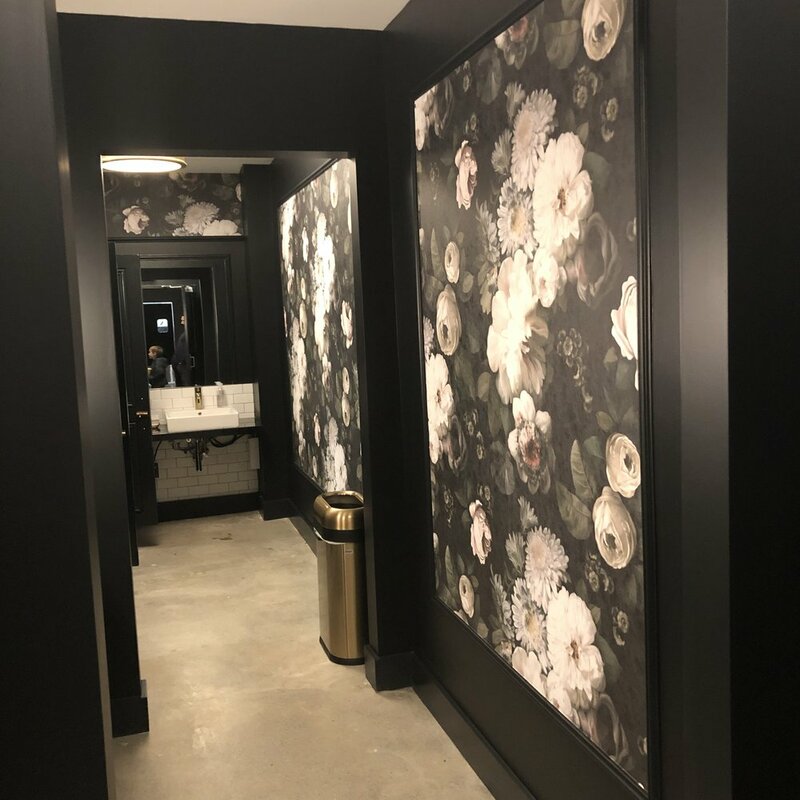 You have the Japanese-inspired wallpaper for the ladies at Quinn’s, the super-comfortable setting in the Roundhouse and Melzingah Tap House, the Beacon Public Library recently renovated theirs, and the bathroom at Billy Joe’s in Newburgh is impressive. There are others, but those are the first that come to mind. Add to the collection this beautiful wallpaper and experience for the ladies (see below) at the Beacon Theater. The lit sign for “Ladies Lounge” that hangs above the bathroom door is an original piece to the theater. Pictured here is one of the Beacon Theater partners, Scott Brenner. He is also a partner in Drink More Good. An eatery is slated to open in the adjoining space. The partners are calling it The Wonder Bar, inspired by the original jazz bar that operated from the second floor of this theater starting in the 1930s and had a good run. Pictured to the right is the original brick wall, with freshly painted lettering. The eatery will be on the other side of that wall, and a take-out window will be open for people who want to order from a special movie menu, to bring food into the theater. At the concession stand, you will find commercial candy, as well as real buttered popcorn and soda from Drink More Good. Spearheading this whole project is Brendan McAlpine of McAlpine Development (formerly known as High View Development Corp.), who also owns Hudson Valley Marshmallow on the other end of Main Street (see our write-up here), who bakes the marshmallows in More Good’s commissary kitchen (located behind More Good’s tea shop). Movie munchie options are looking good - either eat a tub of popcorn, or a bag of marshmallows. Or regular candy. And finish off with some of the best, most natural root beer (or other soda flavors) around. To learn more about all of the partners, click here for our feature story covering the start of this in 2017. All photos are credited to A Little Beacon Blog. For permission to reprint, please contact us. If using in social media, please tag @alittlebeacon. 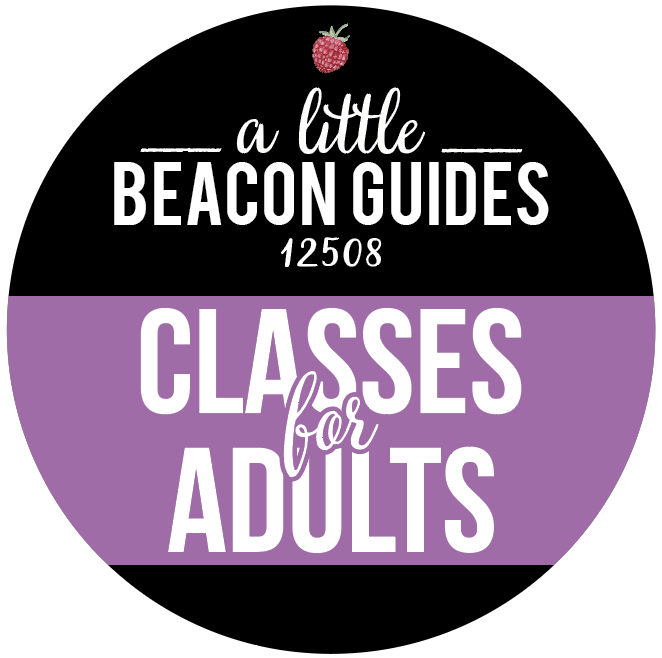 If you are radio peeps getting leads for news clips for your listeners, please consider giving A Little Beacon Blog a shout-out as your source! We love helping local media thrive by crediting each other. Thanks! Story Screen, Beacon Theater, Drink More Good, High View Development Corp.
Howling at the Edge of Chaos is closing on Saturday. Valerie J. Mitchell opened in Beacon a year and a half ago, and created a store that showcases artists' creations that "howl their truth," which is the store's motto. Valerie was diagnosed with a rare form of ovarian cancer in June. Less than three months after her treatments ended, she has learned that the cancer is back. It is in her liver and colon and she is considered terminal. Valerie says that she has chosen quality of life, and is not pursuing treatments. She will be traveling with family and being at peace with her next steps. The lights have been on in the store hit or miss, in between doctor's appointments. We stopped in and made a few purchases (pictured above) yesterday, making sure to get in while she was open, pushing aside any other commitments that were on the calendar. Howling at the Edge of Chaos is at 428 Main Street in Beacon, NY, which is that tiny sliver of a store next to the Beacon Hotel, just down the block from Ella’s Bellas. A first impulse for some has been to reach out to help. Valerie’s passion is spreading truth and awareness, and so far she is doing both: about ovarian cancer, but also about supporting local businesses. First: Valerie wove into her shop's mission to get out the truth. Her storefront window was dedicated to ovarian cancer awareness, as it is one of the most silent and swift of the cancers that often goes undetected. She wants more people to be aware of their bodies and to stay in front of them. A Little Beacon Blog will be sharing an ovarian cancer awareness post to help spread the word and educate about early signs. Second: After Valerie and I hugged and laughed a lot about anything and everything at all, Valerie made sure to tell me about the “Just A Card” campaign. She's very eager to sell everything in the store, so do go in. The shop is very festive, with her sparkly Christmas trees and music (see our Instagram video). The "Just a Card" campaign is one that sends the message that if every person who walked into a shop and expressed their love and appreciation for it just "bought a card" - however small the purchase - it helps the store continue and prosper. A personal regret of mine has been not buying more from Howling at the Edge of Chaos. Many times, I have walked past the store and seen her posts of rings and necklaces on Instagram from different artists she carries, and each time I thought: “Beautiful! I want that! But I'll treat myself to that later when I deserve a treat." Later may never come. Out of this entire galaxy of time, we only live for 100 years of it, if that. Some of us only have 36 years, or 17 years, or 9 years, or 2 years. Don't wait for later. If you want this beauty in your life - these shops, these people who set up the shops and take big risks to be here - go inside. Treat yourself. Make someone happy with a gift. 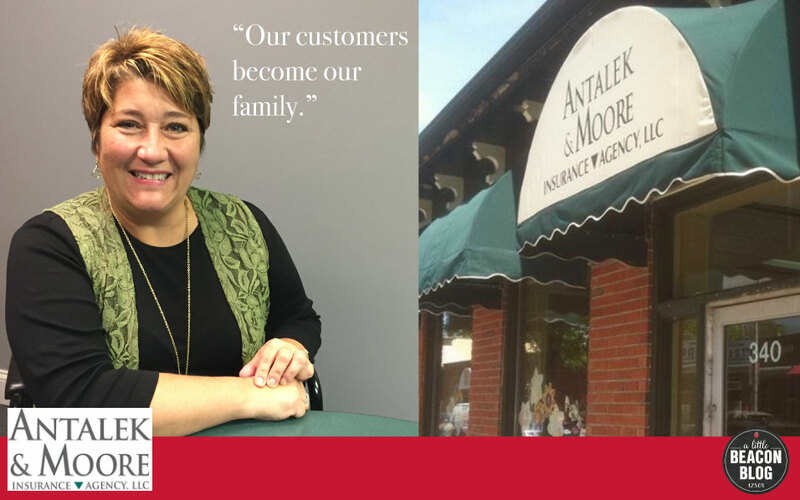 During this holiday season, we’re sending out a simple message of gratitude to one of our first and longest sponsors: Antalek & Moore Insurance Agency. I first met Susan Antalek Pagones during a joint BeaconArts / Beacon Chamber Member Mingle at St. Rocco’s, and it is an evening I will always remember for its illumination of how history is handed down in Beacon. Right after introducing myself and saying I had just moved here and where my house was, Susan turned to her colleague, Terry Williams, to ask her: “Whose house is that?” Now, I knew whose house it was from the young family we bought it from (they bought it years ago, and opted to move closer to the mountain), but Susan and Terry knew it from the two generations of the family who had lived there prior. I have since heard about this other family from our first plumber who could identify the pipes in the basement as his own among the other pipes that were not his work. The next person who knew our home better than me was a handyman I hired for my office to hang an OPEN sign from the ceiling. It turns out he was friends with the son of the family who owned our home decades ago. They have since both turned into professional home improvement professionals, which makes sense when I notice the creatively custom-built details around our home. Susan teaches me about community-centered business all the time. Susan, her partner Vince Lemma, and their team of dedicated agents can help make it easier for you to decipher insurance, whether home, condo, renters, business, health, car, etc. Learn about how they do it in this exclusive interview with Susan Antalek Pagones here, and the interview we did with Vince here. Thank you Team Antalek & Moore for supporting local media and A Little Beacon Blog! Chris and Lisa, the owners of Stock Up, the sandwich shop in Beacon, as well as Marbled Meat Shop in Cold Spring, announced their intentions to close their Beacon location by Sunday, December 30, 2018. The location, at 29 Teller Ave., had long been the home of Beacon favorite, The Copper Roof Deli. Stock Up opened in early 2016 with the intention of making responsibly sourced meat and a variety of vegetables more accessible to Beaconites. Closing a business is always a difficult choice, filled with many variables leading up to the decision. According to their announcement made on Instagram, the main reasons were the need to spend more time with their young family, and the reluctance to raise prices or change their high-quality offerings in order to increase profit margins. December 30 will be our last day in Beacon. We gave it everything, met some incredible people on both sides of the counter, and really enjoyed our time here. We can no longer put our energy into 29 Teller Avenue. Our kid misses us and we are spinning our wheels to keep our doors open week after week. So many of you want to know what happened. The truth is, we could not make this space and this overhead work without a significant increase in menu prices or a complete overhaul of the program. We weren’t up for either. We’ve taken side jobs and cut our team in half. 2018 saw a significant drop in sales across the Hudson Valley and we’ve fallen too far behind to make it through another Hudson Valley winter. We can go on and on. Instead, let us focus on the positive. Come see us in the next three weeks, share a sandwich, a beer, a story. We will miss being part of the neighborhood but know that this is the best thing for our family. Other Beacon businesses like Hudson Valley Vinyl, Tito Santana’s, Ella’s Bellas, The Studio Beacon, Artisan Wine Shop and Echo rallied around the restaurant in the announcement’s Comments section, and even Black Vanilla from across the river in Newburgh, as well as Signal Fire Bread and Industrial Arts Brewing voiced their support and respect for such a hard decision. Stock Up started as a promise to people who loved good, clean, food. They sprouted their own quinoa in their basement. They cured their own meat. Important to them was offering serious cuts of responsibly sourced meat and poultry, paired with seriously-good-for-you vegetable and grain options. Some of Stock Up’s offerings can be found in Chris and Lisa’s original shop in Cold Spring, Marbled Meat, which involves a beautiful drive down a wooded section of 9D, and then crossing over to the rural section of Route 9 (a good excuse to get to know the differences between these closely named roads!). Marbled Meat Shop opened in Cold Spring in 2014 in the compound of shops on Route 9 that include Vera’s Marketplace (famous for their homemade donuts, mozzarella, produce, and amazing everything) and The Pantry (famous for their expanding line of roasted coffees). This is quite a delicious strip of food heaven! While there is a void with Stock Up gone (most of the renters of A Little Beacon Space like edible Hudson Valley would get their catered lunch from them! ), there are other options for high-quality, creative food. Barb’s Butchery is extremely selective with their meats and is known for constantly inventing new flavors of their sausage, which are celebrated during their annual Sausage Fest. Homespun is a Beacon staple (with a second location down at Dia) and Kitchen Sink and Meyers Olde Dutch offer farm to table - some of which is from their own family farm. Beacon Pantry is known for their European selection of cheeses (and recently expanded in their location to make cheese and their sit-down cafe exclusive of each other). Beacon Natural has a daily selection of freshly prepared foods for a quick but healthy lunch or dinner, and Ella’s Bellas is the destination for gluten-free baked goods and cafe experience. Beacon’s Farmers Market, which has moved to its inside winter location at the Memorial Building (aka the Veterans Building), also makes available fresh produce, meats, poultry, fish, pickles, baked goods, and even home goods from a variety of vendors and farms. Even more delicious restaurants are available in Beacon. 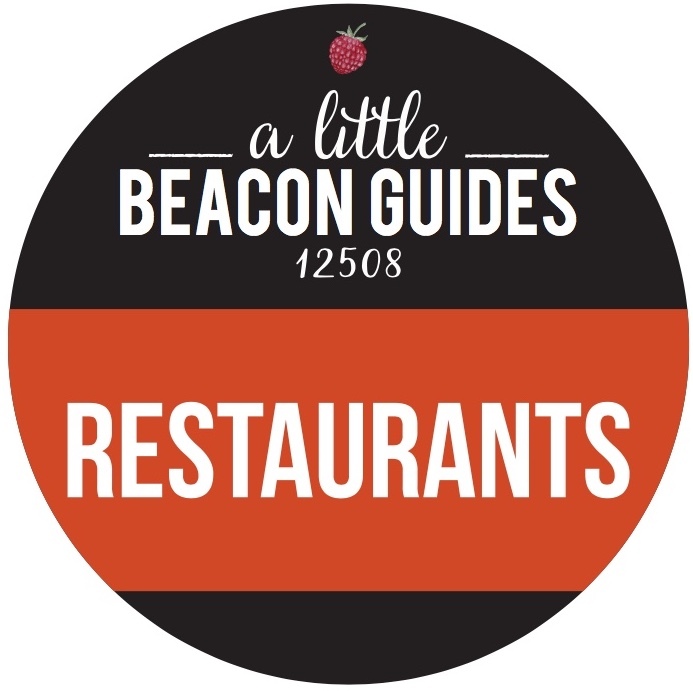 Just check A Little Beacon Blog’s Restaurant Guide to learn more about them. Wishing Chris and Lisa all of the best as they grow in new directions! Main Street Beacon Is OPEN After The Snow Storm! 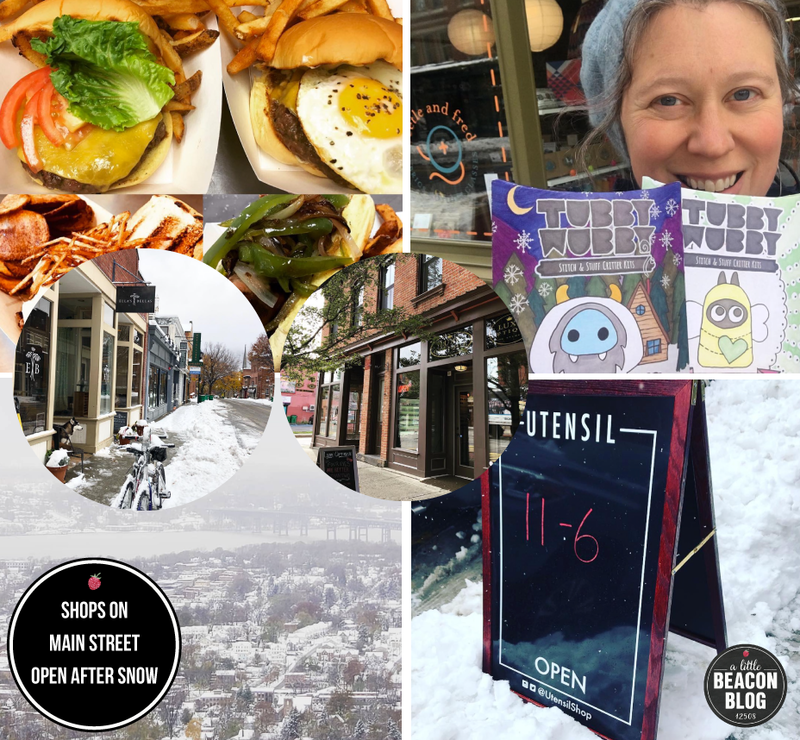 Friday may be a snow day for every parent in the Beacon City School District and other private schools, but businesses are open on Main Street in Beacon. These business owners are resilient, and some were out with their shovels on Thursday night as the snow fell, pre-clearing the sidewalks for Friday morning’s forecast of rain. Sleet did fall at 6:30 am at least, making for slippery and dangerous roadways, but come the 9 am hour, snow was falling, and by 1 pm, we are in full blue sky and sunshine. How is the parking, you ask? Eh, skip the parking, just get your winter boots on and come on out! 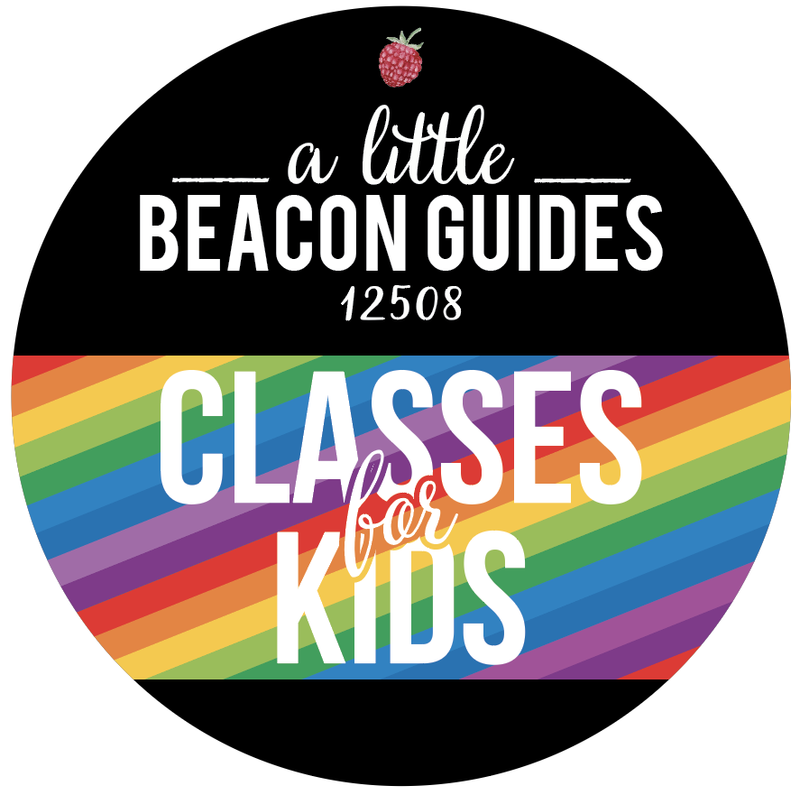 Let today be your day to ride the free Beacon bus up and down Main Street. Hail it from wherever, and get off whenever. Here is a sampling of who you can go see on this snow day, and beyond into the weekend! Hot off the grill at Barb’s Butchery. Hungry! Luxe Optique, the stylists will see you now! Clearly, this picture was from before the snow fell, but they are still open. You can’t keep these bakers away! Ella’s Bellas is all dug out, open for business. making up some chocolate ganache this morning. Because what Are you gonna do on a snow day… stitch and stuff cute critters of course! That, and yarn and fabric inside at Beetle and Fred. Lambs Hill Bridal Boutique at the base of the mountain is not open today due to snow, but this is the view from the Lambs Hill Wedding Venue at the top of Mount Beacon, overlooking the city-town. Luxe Optique Expands Next Door - Use The Door On Right! 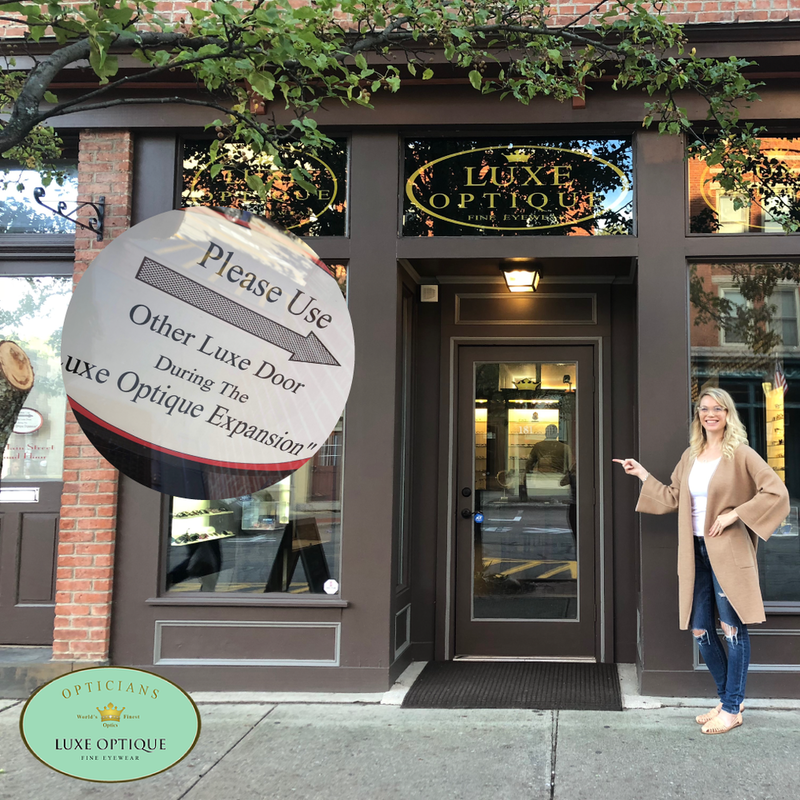 Luxe Optique came to Beacon about two years ago. It wasn’t the first glasses store that owner Laurie Riehle had opened - and it won’t even be her last. Prior to coming to Beacon with her loyal crew, Laurie sold her optics shop in Warwick, NY, but couldn’t sit still. She moved into 183 Main Street, the spot on the corner of Main Street and Cliff Street that had been the location of School of Jellyfish, the curious combo shop that was half sustainable architecture teachings, and half hot chocolate bar and source of an award-winning truffle (really, it was a place to present green architecture with bait of really good chocolate - it worked). After a time, the building that housed Luxe Optique went up for sale, and Laurie went for it. She bought the building, which included two storefronts. 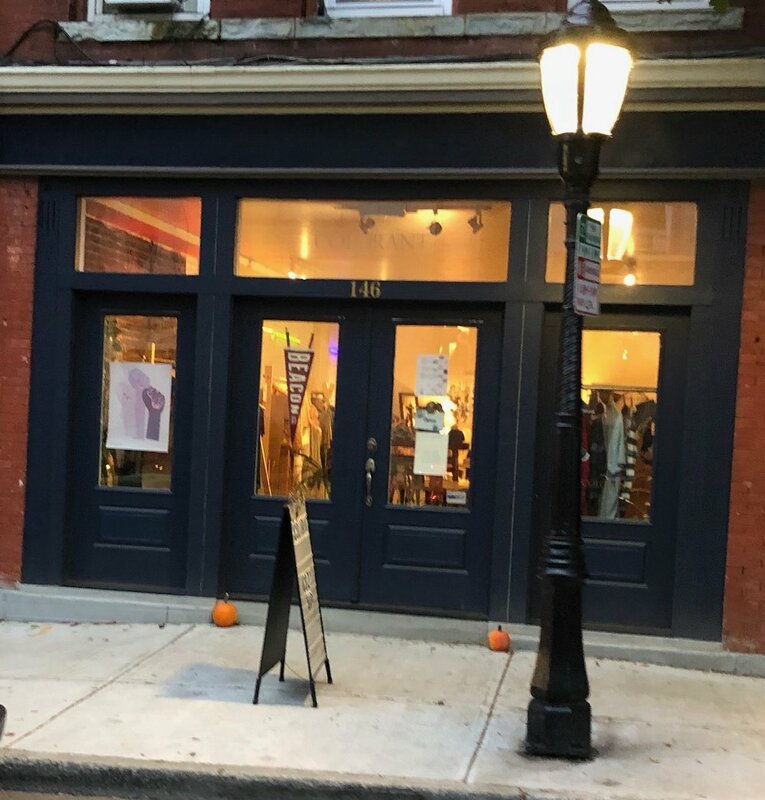 At the time, Beacon Pilates was upstairs (they have since moved to West Main Street by Brett’s Hardware, with better parking - and you can always find their outpost at All Sport) and Bellus on Main, one of my personal favorite boutiques while they were here for high-end shoes. Luxe Optique are collectors of distinct lines of hand-crafted glasses, and have fantastic eye doctors to give eye exams to adults and kids in their store for glasses and contact prescriptions. You can see how Luxe Optique quickly got crowded with their ever-growing number of frames for kids and adults, and the eye exam office. Luxe Optique began an expansion into the second storefront. For now, the original side of the store on the left is under construction, and the new side on the right is open! A larger selection of children's frames - getting a thorough eye exam is really easy. A larger selection of sophisticated affordable brands to make sure everyone has access to good quality eyewear, no matter the budget. A private lounge that patients can book (for free) to secure time with an optician like Ryon, Christos, Julia, or Laurie herself so they can receive the best experience possible. Keep your eyes on these folks - and get some new glasses and an exam to see everything better. P.S. : Luxe Optique is known for making super-fine adjustments to glasses. For those with particularly tricky prescriptions, going there is like therapy for your glasses while the pros adjust them. Editorial Note: Luxe Optique is a sponsor of A Little Beacon Blog, but this article is not a part of their campaign. Their expansion is part of the energy and Shopping Guide Shuffle on this end out town. Do see their listing with more pictures in our Shopping Guide. You’ve driven by it countless times - the construction going on at 143 Main Street, the building that formerly held the office for Shane Hobel’s The Mountain Scout Survival School. 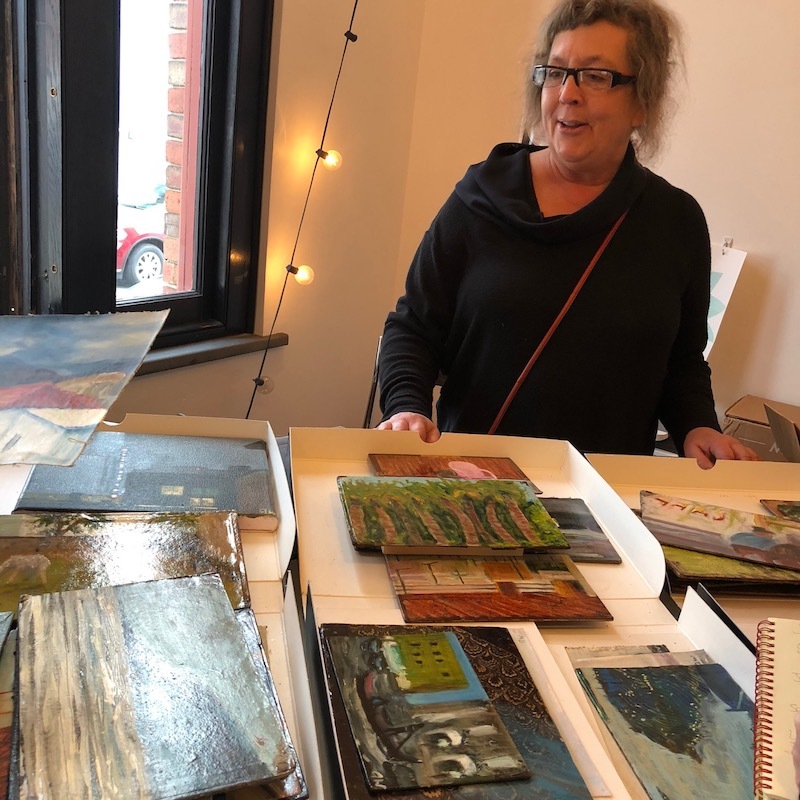 Prior to that storefront, the space was the location for the art gallery Fovea before it moved across and up the street to the second floor of Hudson Beacon Glass. Slated for a Saturday, November 10, 2018, grand opening, Utensil Kitchenware, owned by Emily Burke, will move from her location on the east end of town to this larger, fully renovated space on the West End. 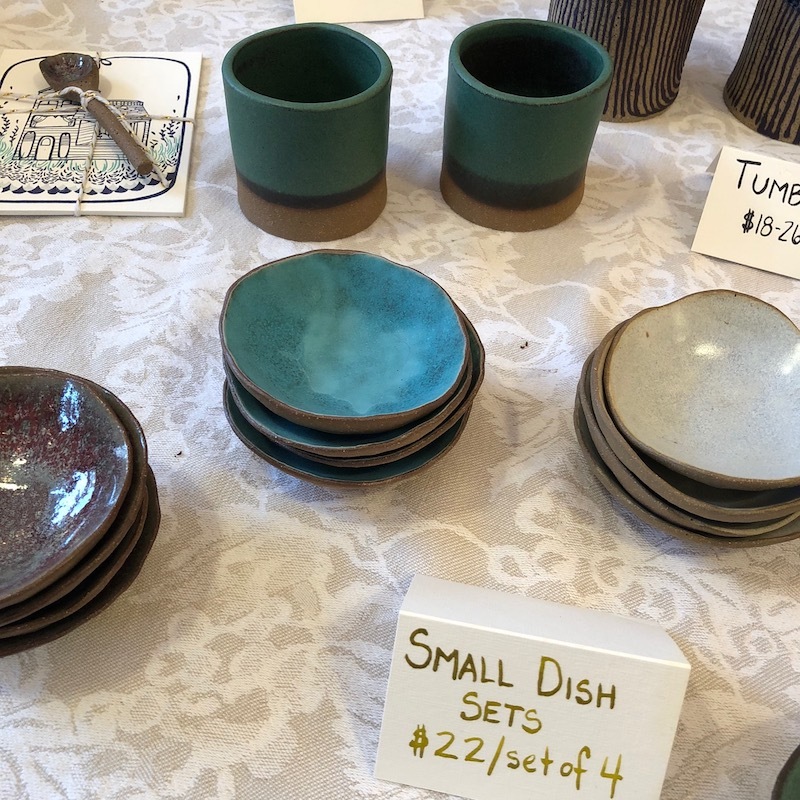 Emily and her architect husband designed it specifically to fit the kitchenware store. The store has always held a cozy collection of pretty much any kitchenware item you needed - or didn’t know you needed - and now will offer an interactive demonstration space so that you can learn how to use the gadgets that Emily has discovered. The front doors have been expanded to be double doors, the front windows enlarged. If you’ve walked by, you may have seen exciting red ceiling beams on the inside. 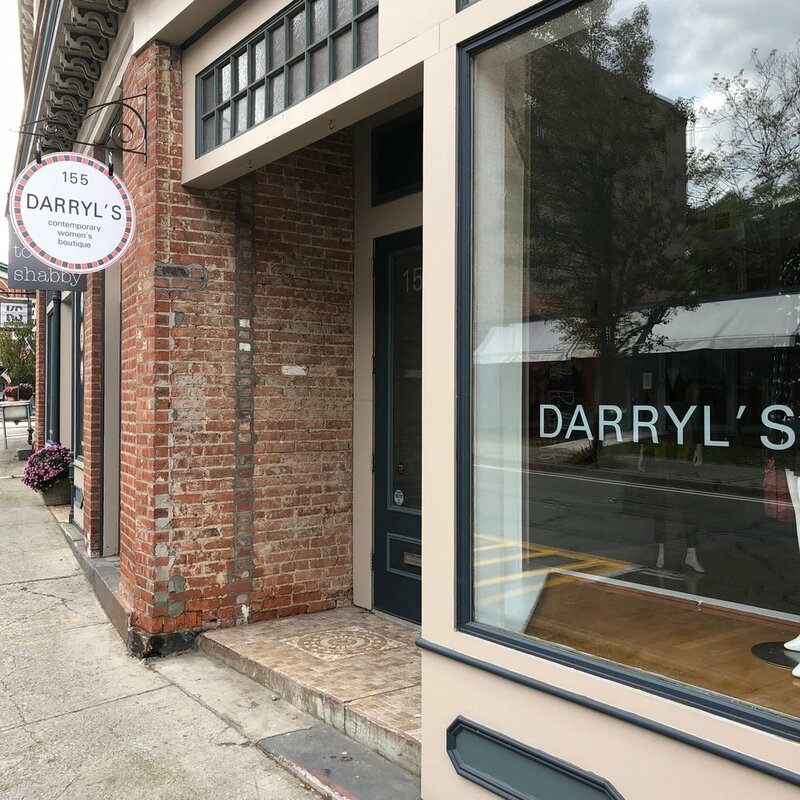 Newest shop, Darry'l’s Contemporary Women’s Clothing, opened in former Nella’s Bellas, which had been Global Home. There’s a lot going on at this end of town - referred to often here as “the west end of town near the train” - from building renovations to business relocations. This change started when a large swath of property - 20 parcels - changed hands from the Piccone family (see our coverage in “Top Nabisco Pressman Starts Over At Age 54 To Open Salon - Mr. Bell’s Story”) to new owners in one of the largest real estate deals in Beacon’s history. Colorant, now located at 146 Main Street started out inside of Beacon Healing Massage as a pop-up shop, turned perma-pop-up shop, and now has a permanent home across the street in the space formerly occupied by Miss Vickie’s Music. 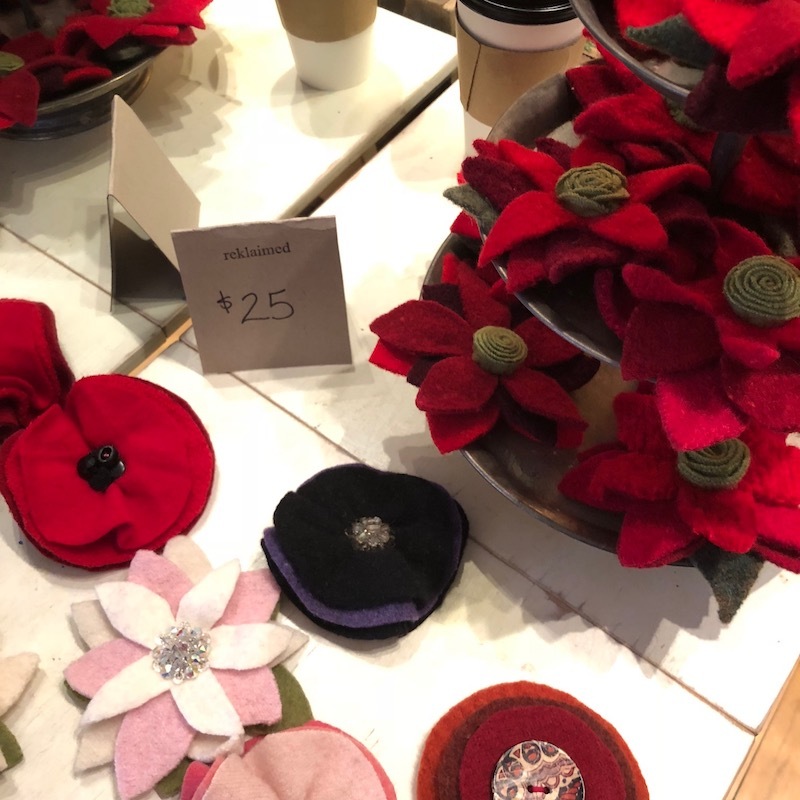 Storefront shops always come and go on any Main Street, but taking a moment to reflect on what’s going on, not only has their been an ongoing Shopping Guide Shuffle since the summer, but there are building improvements as well. At first blush, one might think that a bunch of new businesses are moving in. However, Beacon businesses already located here, for the most part, are simply moving around. The first major move and renovation was to Colorant’s space, which used to be a seasonal pop-up shop in Beacon Healing Massage’s space, which is right next door to the (now former) Mountain Scout office. Beacon Healing Massage’s new neighbor will be Utensil. Colorant transitioned into a perma-pop-up in the Beacon Healing Massage space, and then officially moved out and across the street into the studio where Miss Vickie hung her musical shingle - but not before that space was totally renovated for Colorant. Miss Vickie has since moved to another location owned by the same people a few blocks up, down the alley near the shoe cobbler and Mr. Bell’s barbershop. Miss Vickie’s Music, down the alley near Mr. Bell’s barbershop. reMADE, the boutique carrying handmade Hudson Valley items recently closed, yet the space has re-opened as a new store - Lewis and Pine. The new shop, however, occupies half the space. The store was essentially two stores inside with an existing wall and door separating the two. This can make for an awkward layout - or not - depending on how you set it up. The space will now be two storefronts. Wait - Where Is Mountain Scout Going? A survival training workshop on the Mountain Scout property in Hopewell JuncTion. The inside of the Mountain Scout office was really neat, and was set up as if you were outside in the wilderness. The Mountain Scout trains in survival tactics in the wilderness and taps into primitive stuff we humans otherwise may have disconnected from thanks to modern technologies. The true training takes place on several acres of land that Mountain Scout owns in Hopewell Junction, just 5 minutes from I-84 or the Taconic. The big, tan Mountain Scout passenger van you see driving around Beacon is part of their offerings of shuttling clients to and from the Beacon train station to their land in Hopewell Junction for workshops or private trainings. His classes are just so neat - you should check them out for survival tactics for kids or adults, including Family Emergency Planning. There are incredible finds! So many shops, galleries and eateries. We have a few articles slated to tell you about them, but a lot of good stuff. Loopy Mango (giant yarn), the No. 3 Reading Room for extremely rare art books and interesting print things not found in art galleries or book stores, The Vault for creative cocktails and one of the best baby kale Caesar salads, and Jeffrey Terreson’s curious dimensional paintings. Eat up our write-ups of all of the shops in A Little Beacon Blog’s Shopping Guide, and the eateries in our Restaurant Guide. Don’t miss our Brunch Guide, of course!